To a group of seven young volunteers calling themselves Rame Rame Jakarta (Hustle and Bustle Jakarta), the informal sector is a fascinating aspect of city life, full of interesting layers of information. Rame Rame Jakarta relies mainly on Instagram (@rameramejakarta) to spread human interest stories about the city’s informal entrepreneurs and their role in sustaining the economy. Juggling between their main jobs and interviewing the entrepreneurs, the group, which was formed in mid-2017, has published seven interviews with pictures on rameramejakarta.com. In one of the published interviews, Rame Rame Jakarta interviewed Rofi and Marwiti, owners of a warteg (Tegal food stall) in Kampung Karet, South Jakarta. 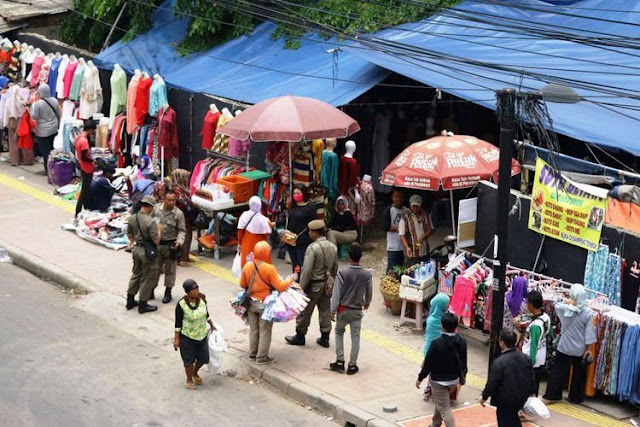 The couple told Chris Kelly, the group’s co-founder, that they had come from Tegal in Central Java, where they had started their business more than 30 years ago. They opened a warteg in Setiabudi in Central Jakarta before moving to Karet in 1997. The entrepreneurs said they had experienced a lot of changes in their industry. “But warteg meals are always popular,” they said. “Eating and drinking is something that everyone has in common. It’s one of the most obvious and easy ways to explain the interaction most people have with the ‘roots economy’,” Chris told The Jakarta Post. Rame Rame Jakarta also met with Syaifudin, a peddler selling paraphernalia especially for construction workers in Kebon Sirih and on Jl. Jaksa, Central Jakarta, since 2012. Syaifudin, who lives in Manggarai, South Jakarta, sells hats, bags, measuring tape and more. “I sell [the goods] on the street, because there are many building projects in the area. The [construction workers] are my customers,” he said. Another initiator of Rame Rame, Andesha Hermintomo, said he and his friends wished to show that residents, especially of the middle-class, actually needed informal entrepreneurs and vice versa. Andesha said by featuring the human side of these street vendors, Rame Rame Jakarta wanted to encourage a warmer encounter. Chris echoed that statement, saying sometimes it was hard for people to imagine the lives of informal entrepreneurs.